HidroClean mechanical cartridge filters offer pressurized, pump-fed mechanical filtration to a minimum particle size of 105 microns. They are ideal for use as a pre-filter to pump-fed bio-filters to remove solids before they are able to foul the biological media. HidroClean units are designed to be easy to maintain and cleaning the cartridge requires no special chemicals or tools. Settled debris within the cartridge can be flushed out by installing a drain valve (not supplied) to one of the two outlets at the base of the filter body. The cartridge itself can be cleaned using a standard hosepipe. - The cartridge is removed from the filter body and the central cap unscrewed. The cartridge can then be cleaned simply by applying a jet of water which causes the filter ring to turn on the central axis. Dirt and other trapped debris is washed away quickly and easily. The HidroClean, we have found works , extremelly well when used in conjuction with a surface skimmer. Optional pressure gauges (not supplied) can be fitted to the inlet and outlet ports of the filter to allow the operator to observe when the cartridge needs to be cleaned. Please e-mail or contact us for more details. 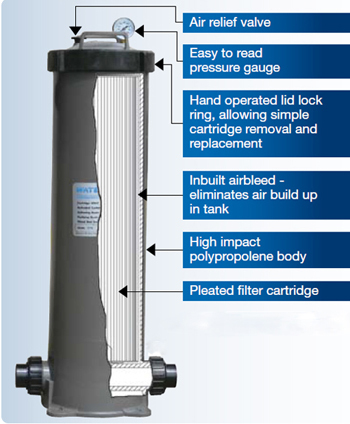 Compact and Versatile Filtration, these Waterco Cartridge Filters are designed to give years of trouble-free service. The 30 micron Waterco Cartridge Filter utilises a specially treated polyester fabric, which is pleated into a cartridge. The pleating gives it an extremely large surface area. The Waterco Cartridge Filter is ideal for ponds where backwashing may not be practical, cleaning simply involves lifting out the cartridge and rinsing it. Warranty: 10-year conditional tank warranty and 1 year warranty on all other components, excluding the cartridge.